Experience panoramic views of the City of Lights from the 19th floor Skyline Paris Lounge + Bar! While not technically located iN Paris, the Meliá La Defense is closer to attractions than others and very well connected by public transport. Plus, this modern 4-star hotel offers great views, an excellent breakfast spread and larger accommodations than your typical Parisian city center hotel. This makes it ideal for families and our iNSIDE EUROPE 2019 BON VOYAGE group. 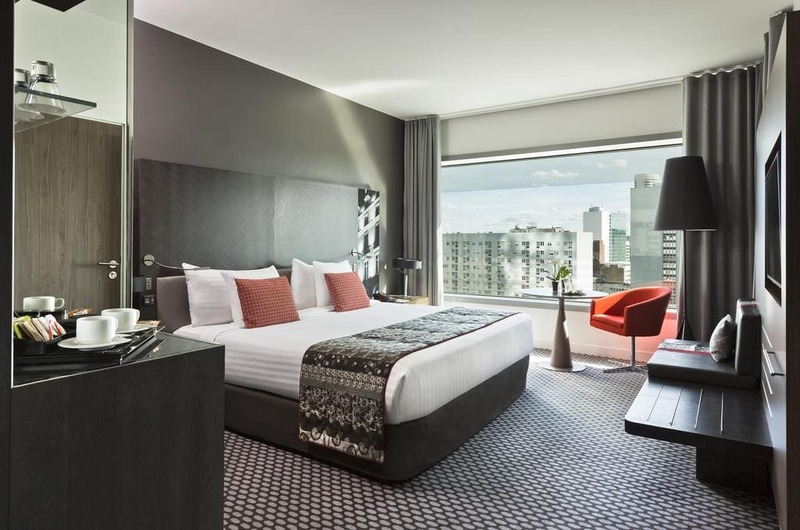 Room sizes at the Meliá La Defense start at 32 square meters (roughly 345 square feet) and accommodations offer either two twins or a queen/king bed, with fine linens. You’ll feel comfortable and carefree with free Wi-Fi, individual temperature control, 39″ flat screen TV, minibar, safety deposit box, hairdryer, iron/ironing board, bathroom with rain shower head, selected amenities and 24-hour complimentary fitness room access. Connecting family rooms are also available, as well as corner Junior Suites with great views of Paris. For more photos and information, visit the official website of Meliá La Defense. Did you know that at iNSIDE EUROPE there is no degree of separation? Unlike others, we personally inspect each hotel and never outsource bookings to third parties. This ensures a high level of service and attention from the hotel to our travelers, plus special perks such as quiet rooms on higher floors and more. BON VOYAGE 2019 Family Getaways by iNSIDE EUROPE Hotel iN Paris Melia La Defense We have been there!